So lately I’ve discovered the joy of subscription boxes. These little boxes of beauty come once a month and bring wonderful new products to try. I try to keep them a surprise but tend to cheat with my Ipsy (see my review of April’s box here) and Birchbox subscriptions. I always find spoilers before the boxes ship! Since a month is a looong time to wait for new beauty products I have discovered a new company to supplement my boxes between months. 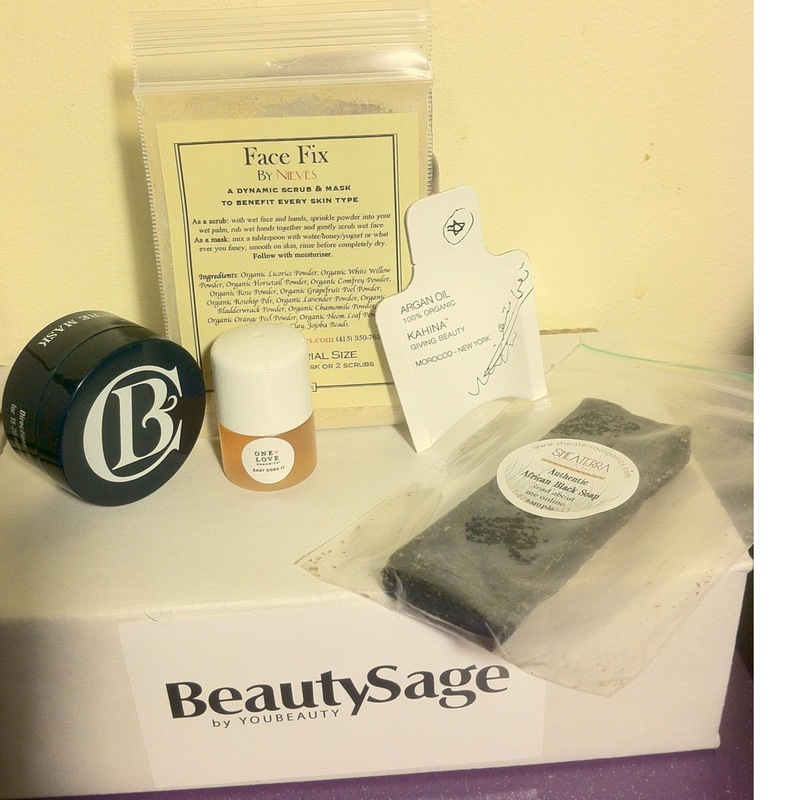 Beauty Sage offers deluxe boxes for $10 a month, including shipping. They currently have four different boxes to choose from, and since you know what is in each box it is easy to choose the box you want. Or like me you might want them all, in which case I fully suggest ordering all 4, you won’t be disappointed! Kahina Giving Beauty 100% Organic Argan Oil ($36): This oil is actually in 3 out of 4 boxes, and I am not upset about that! It makes my skin feel amazing, and my husband said my porcelain skin looked better than normal after I applied it. The company says it “gives supple, radiant skin”, and it does! The sample is a decent size too, I’ve been using it daily all week and still have some left in my first sample. I expect the 3 will last me all month, yay! Joya Travel Roll-On Composition No. 1 or No. 6 ($28): So I am not sure what No. I got, but it’s not a favorite. They state that it “adjusts to your body chemistry”, but for $28 I think I will pass on the Joya and stick with my normal Love And Toast roll-ons. This sample is a little small, but I don’t love the scent so I’m not too disappointed. Nuxe Huile Prodigieuse Multi-Usage Dry Oil ($46): This is my favorite of the box. It is a dry oil that works on face, body, and hair and it smells fantastic. I used it on my husbands sand-paper hands tonight and it worked miracles. He even loved the scent, and it contains “6 proven plant oils” that softened his skin. 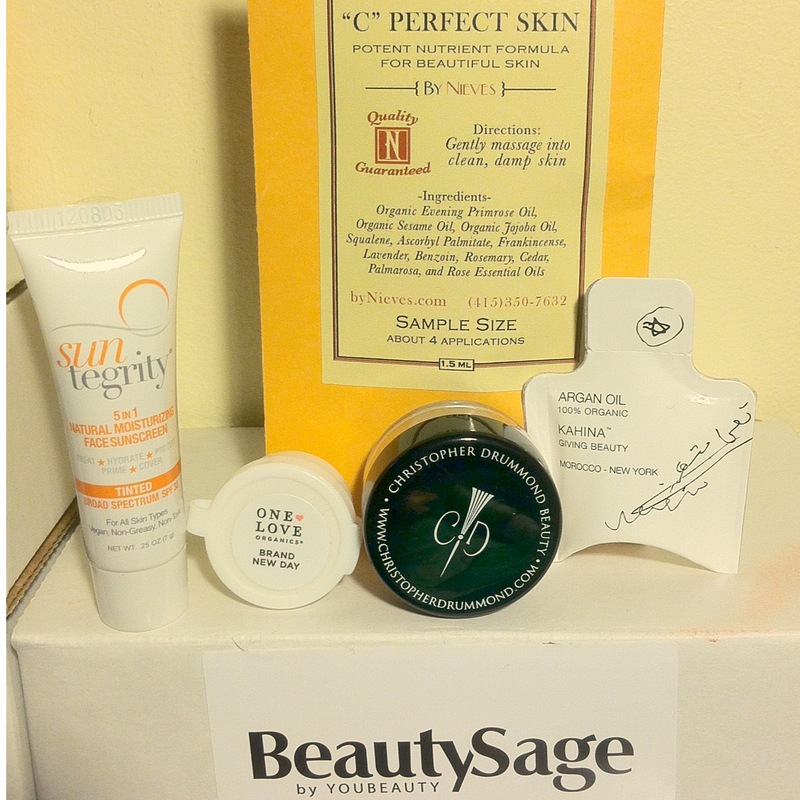 It is a huge sample and a little goes a long way, always a bonus in a sample box! Shea Terra Argan and Green Coffee Around Eye Serum ($38): This sample promises to “send bags packing”. Well, I don’t really feel like I have bags to send packing despite my normal lack of sleep, but it makes the skin around my eyes feel good so I figure it can’t hurt. Any anti-aging products I put on now will hopefully make my skin look great for the long haul of life. 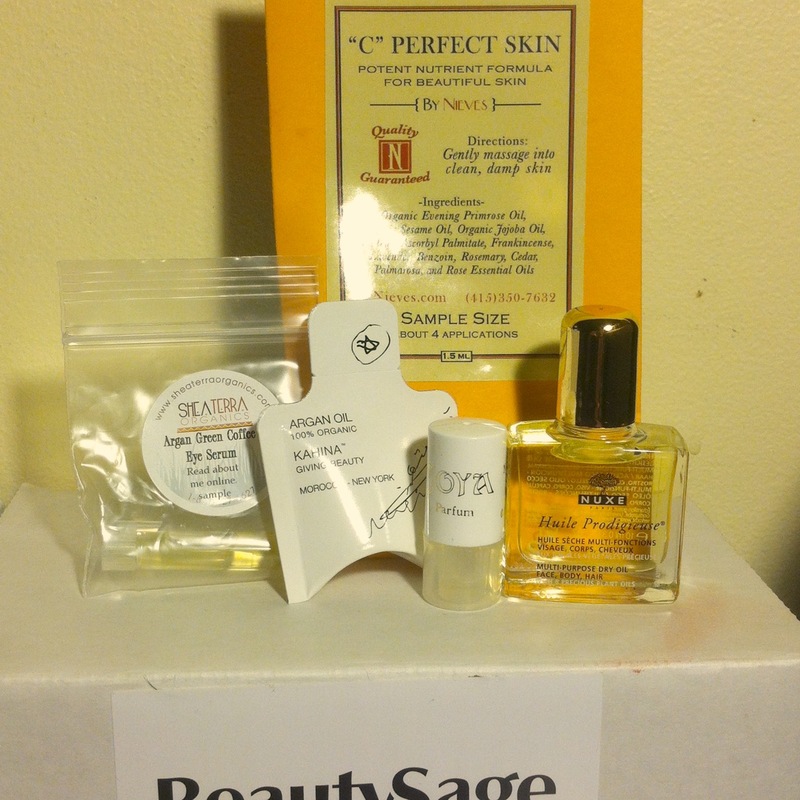 By Nieves “C” Perfect Skin Serum ($35): I have not used this little vial of serum yet, but it is “proven to tighten and brighten” so I look forward to trying it soon. It seems like a fairly small sample, but I bet you don’t need much. Each sample should contain 4 uses, but I bet I can get at least 5! This box, curated by Prevention Magazine, is right up my alley. I’ve had sleeping problems for as long as I can remember, it gave me pretty intense anxiety as a child and I currently use melatonin pills to help with this lack of slumber. These products are pretty awesome, but they haven’t really changed my sleep patterns. Still, I’m pretty happy with this box! Lotus Wei Quiet Mind Mist ($40): This smells amazing and according to the pamphlet that came in the green mesh bag along with the sample it contains lemon, geranium, and coriander. Surprisingly it does not contain the typical “hey you should go to sleep” lavender and chamomile, which is a nice change. I’ve been spritzing it on every night and I have been feeling pretty relaxed. I also have been fighting off a cold and have felt exhausted lately, so it’s hard to say if this spray has made a difference but I love the scent, so it really doesn’t matter if it helps me sleep or not! I would love to try all the Lotus Wei scents, especially Pure Energy (grapefruit, coffee, and cinnamon) and Joy Juice (blood orange, davana, and marigold). It comes in a decent size spritzer bottle too. Goldfaden MD Wake Up Call ($80): This moisturizer that contains CoQ10 and a nourishing retinol is said to plump up your skin “so you wake up looking like you had a facial”. Well, I’ve never had a facial (my first is scheduled for next week!) so I don’t know if that’s what it looks like, but my skin did feel pretty good in the morning. I really like this product a lot and the sample should last me a few weeks. Shea Terra Around Eye Beauty Serum ($38): See the review above, it also came in the “oil you need” box. Carol’s Daughter Monoi Repairing Hair Mask ($29): The card in the box says to ” spot apply this dry (split ends, frizzes around your hairline), let it penetrate all night and rinse in the am”, and so that’s what I did. It smells great, and it made my dry, color-treated, overwashed hair feel soft and silky, and my hair was super shiny. This also is a huge sample that will last a while, since a little goes a long way in my thin hair. By Nieves The Balm: This is a great multi-purpose sample. Cuticles, dry spots, and chapped lips are all soothed with this amazing balm. It comes in a pretty big pot that should last a while too! Also included in this box is a card for a year long subscription to Prevention magazine, which is at least a $10 value. Can’t wait for my first issue! Since I loved the first two boxes so much I had to order the next two, The Look Younger box and The Clear Skin box. Since I have entered my 30’s my skin just isn’t as luminous as it was in my 20’s and is giving me more trouble than it did as a teenager! These two boxes contain products that will hopefully make my skin behave itself again. Suntegrity “5 in 1” Tinted Natural Moisturizing Face Sunscreen ($45): This sunscreen “conceals, perfects, and protects”. The sample comes in a light color, which is perfect for my pale skin and is SPF 30, which is awesome since I live close to the sun in the mountains of Colorado. Now if it would only stop snowing so I could try it out. I currently use Garnier BB cream (which is comparable) so I look forward to trying this out, although it smells kind of icky. I do like that it is vegan, non-greasy, and non-toxic though. Kahina Giving Beauty 100% Argan Oil ($36): See my review above. I love it! One Love Organics Brand New Day Microderma Scrub & Masque ($39): This powder “polishes skin with fresh pineapple enzymes”, and although I have not yet tried it I love it for the smell alone. It smells like pineapple and although the sample is pretty small (and easy to spill everywhere!) I hope I can stretch it out for a few uses. My dry skin is always in need of exfoliation! Christopher Drummond Beauty Blush Alluring in Pink ($28): “Get a youthful rosy flush!” Well, wine does the same thing for me. This color is amazing on my hand though, which is the only place I’ve sampled it so far. It is a great pink color with a little shimmer to it. I very rarely wear blush though, so I guess I’ll save this sampling for a special occasion. I also can’t figure out how to get a brush into the pot to use it effficiently without wasting it! By Nieves “C” Perfect Skin ($35): Another double from the Oil You Need box, see my review above. Well, see my thoughts since I haven’t tried it yet. So this last box is honestly the most appropriate box for me right now, since my skin has been uncooperative lately despite the homemade facial masks I have been using. My love of wine in the evening isn’t helping, but my goal in the next few months is to drink more water and less wine. And to keep taking my vitamins! Clarks Botanicals Deep Moisture Mask ($72): This can be used as a mask or a moisturizer and since this sample is pretty small I most likely will use it only as a moisturizer to make it last longer. My skin feels smooth and hydrated when I put it on although it is a little too perfumed for my taste in skin care. Kahina Giving Beauty 100% Argan Oil ($36): Yep, still love it. See my review above! By Neives Face Fix ($32): This doubles as a mask or scrub. I am intrigued by this powdery sample and hope there is enough to try it both ways! Shea Terra Authentic African Black Soap ($8): This is honestly one of the only samples that is in my price range for a full size sample. It makes my skin feel squeaky clean and is a proven acne-fighting powerhouse. I’ve heard quite a bit about black soap lately, so I am so excited that I finally get to try it out! One Love Organics Easy Does It Foaming Cleanser ($29): I love a good foaming cleanser. This smells pretty neutral and is a pretty small sample so I’m not sure I’ll really be able to get a good idea of what this product does. 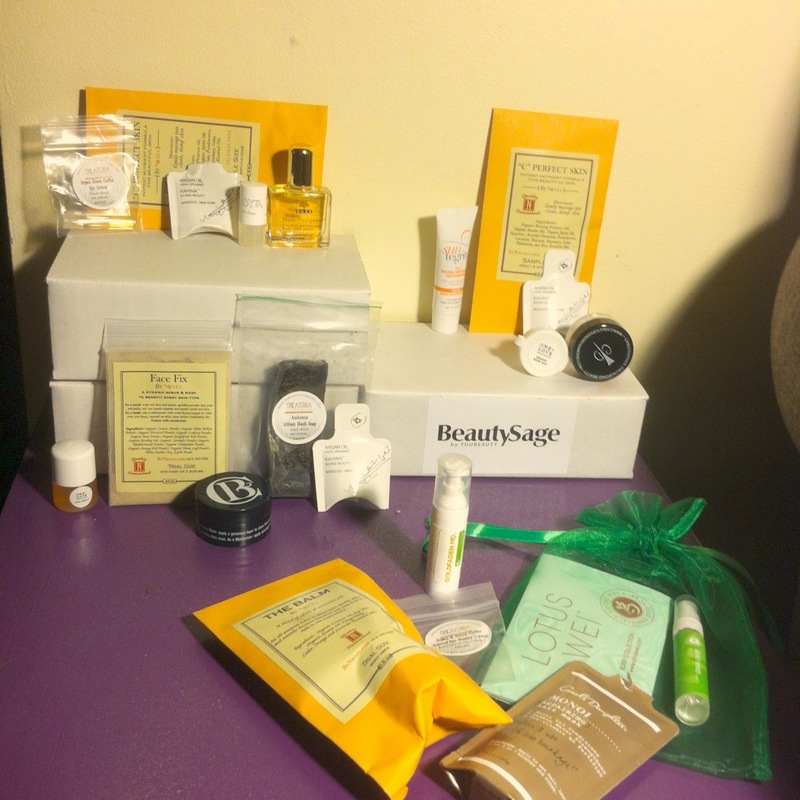 Overall I am super happy with all the boxes I received from Beauty Sage. I will use everything in these boxes, which I can’t say about my monthly subscriptions. Now I just hope I don’t fall in love too much with the products, since most are a little out of my price range. Although the prices are not so outrageous that I can’t budget it in if I reeeeallly love something. 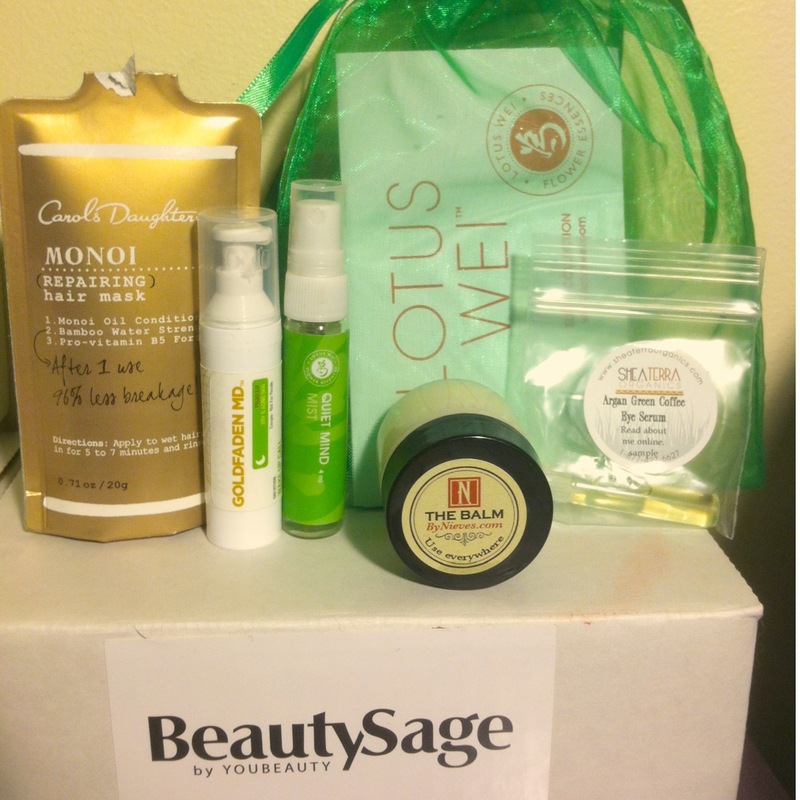 Also you can earn points with every purchase on Beauty Sage just like you can with Birchbox, which is a nice perk. I can’t wait for my first issue of Prevention too, and I hope Beauty Sage will release some different boxes soon! Now for what YOU can get out of reading this long review! I have a few discount codes that came in my boxes. Comment below for a code to receive 10% off full size versions of the samples reviewed above ( I have 4 that expire in about 6 weeks). I also have 2 codes for 10% off your order, expires 5/24/2013. First come first serve!